Tablets are the perfect device for playing blackjack – they’re big enough to experience the stunning graphics and place wagers easily, but small enough to still be quite portable. Leading software developers are creating titles daily to be compatible with an array of tablet brands. We detail which ones below, as well how to play on your device. 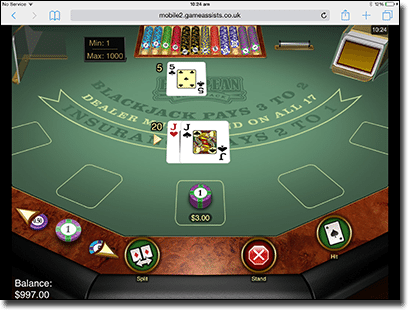 Blackjack titles by top leading software developers have been optimised to suit mobile devices and can actually be considered to work better on tablets than on smartphones. You can play with real money, or in free play mode at first to warm up and get use to the feel of placing bets on your tablet. 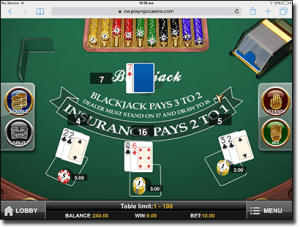 Playing blackjack on your tablet is easy. Simply follow our links via your tablet’s browser – Google Chrome, Firefox, and Safari are all compatible – and log into your casino account to get playing. If you haven’t signed up to any of our casinos on your desktop yet, you can do so directly on your tablet. Compare the welcome packages and the blackjack titles available to decide which mobile casino suits you. 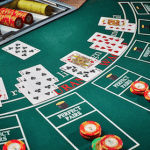 Then simply tap on the blackjack category, which may have its own category or may be located under table games depending on which mobile casino you have chosen, and then on a title of your choice. Here you will be able to tap on the table to place a bet, an then on ‘Deal’, ’Hit’ and ‘Stand’ in order to play. There are other ways to access our favourite casinos too. Casino apps: There is a native app available to download, but only from Royal Vegas. This runs independently from your browser, and we recommend following our links to RV here and downloading it from their site for smooth installation. It will sit on your home screen of your tablet where you can tap on it and be taken straight there as you would with any app on your home screen. This app is known as Regal Vegas as real money casino apps aren’t accepted in application stores, but the operators found a loophole marketing it this way. All our other mobile casinos either offer a web app you can download, or you can create a web app yourself (this runs via your tablet’s browser but sits on your tablet’s home screen like a native app – the toolbars that appear when playing via your browser disappear too). To make one head to your preferred mobile casino by clicking on the links on this page, then simply tap on the menu toolbar of your browser where the option ‘Add to Home Screen’ will appear. Tap on this, name the web app (we recommend naming it the after the casino) and the icon will appear on your tablet’s home screen where you can tap on it at any time and be taken to the site. What types of blackjack can be played on tablets? There are quite a few blackjack titles that have been optimised for mobile devices, specifically from our favourite software developers – NetEnt and Microgaming. We detail a sample of what blackjack titles you can find at our recommended mobile casinos. Single Deck Blackjack Pro (Net Ent): This NetEnt blackjack title has been optimised for mobile devices and is played with just one standard deck of cards. The graphics represent a close up of a traditional green table which gives it a mobile game feel. 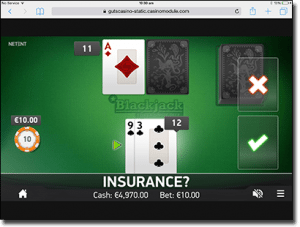 The rules are the same as the desktop version with Blackjack offering a 3:2 payout and insurance offering a a 2:1 payout. European Gold Blackjack (Microgaming: Microgaming’s take on a classic game is available on tablet devices. Featuring two standard decks, the dealer has to stand on all 17s, players can split only once, and can only Double if they total a value of nine, 10 or 11. The graphics are crisp and represent a traditional table, even fit with the wooden edges. 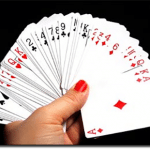 Multi Hand blackjack – Play’n Go: Once you’ve got the hang of playing 21 on your tablet, you may want to step things up and play a multi-hand title. Play’n Go’s version for tablets is perfect to try featuring up to three hands to be played at once, on a traditional green table. Dealer must stand on all 17s, while blackjack pays 3:2, and insurance pays 2:1. Regardless what tablet you have, you can follow our links and play the titles at our recommended tablet casinos as they support mobile devices thanks to the modern hardware and software they employ. Some older devices may be a bit slower at loading games which ultimately hinders smooth gameplay, but the best way to see if your tablet works well with mobile blackjack titles is by trying them out yourself. Royal Vegas – offers a huge selection of Microgaming blackjack variants on tablet and smartphones, and are the only casino with a dedicated and available native app to download for those who prefer that option. G’Day Casino – Hosts Net Entertainment tablet blackjack games and has special promotions. Guts casino – Hosts multiple software providers, so you can play NetEnt, Microgaming, and Play’n Go blackjack games on your tablet. All mobile blackjack tablet sites employ 128 Bit SSL security to ensure player security while playing.